Rotary leaders such as International president Ron Burton now urge us to diversify our membership in Rotary International. 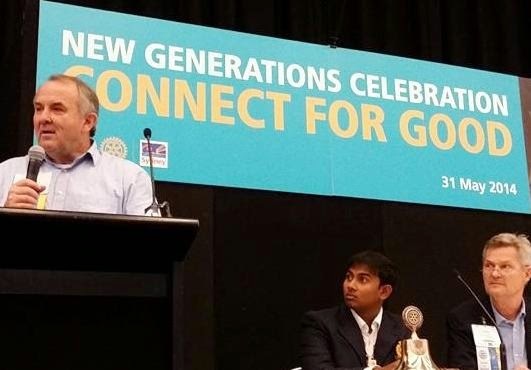 This was a key message at the 2014 Rotary International Convention in Sydney. New young members are needed as much as experienced ones. The organisation will only survive if membership numbers are increased. Rotary is changing lives of the disadvantaged in developing countries. We are also empowering local citizens to improve their lives in areas such as practical work skills and wellbeing. Rotary leaders reminded us that more can be achieved through strength in numbers. This requires strategic growth of membership. I personally believe we need to communicate the benefits which members gain, as much as what the external community gains. Sydney City Rotaract provided a social environment in exciting events such as charitable movies and trivia nights. But my active participation happened when there were opportunities to learn. Judith Durham has a significant history with the Order of Australia. The Seekers were recently awarded as Officers in the Order of Australia. Recent press coverage focuses on the 2014 award. So, to a newbie Seekers fan, it would appear the band just started gaining attention from this institution. In reality, The Seekers have been linked with the Order for decades. Judith was actually first awarded with a Medal of the Order of Australia (OAM) in 1995 for her work in music. This was soon after The Seekers reunited in 1993 for their 25th Anniversary Silver Jubilee. Judith paved the way for Australians to participate in international music charts. Congratulations Judith for all your contributions to the music industry. We are lucky to still have you with us. Daffodil Day is an important way to support the Cancer Council in August. Buy a daffodil or yellow memorabilia on 22nd August 2014 to give awareness and financial support to this organisation. Many charities and ribbon days exist for specific types of cancer. But the Cancer Council works to help all types of cancer. Small simple contributions can change the life of a cancer patient. The Cancer Council's web site outlines just how tangible these contributions are. $10 will give much needed exercise for a cancer patient. Physiotherapy, rehab, and other exercise programs are crucial for cancer patients' recovery. $50 can help a cancer patient to speak on the phone with a nurse. Patients always have questions about their conditions. This source of personal advice is just as important, possibly more useful, than a Google search. Gary Wilson OAM was featured in the Parramatta Sun for his work in Toastmasters. 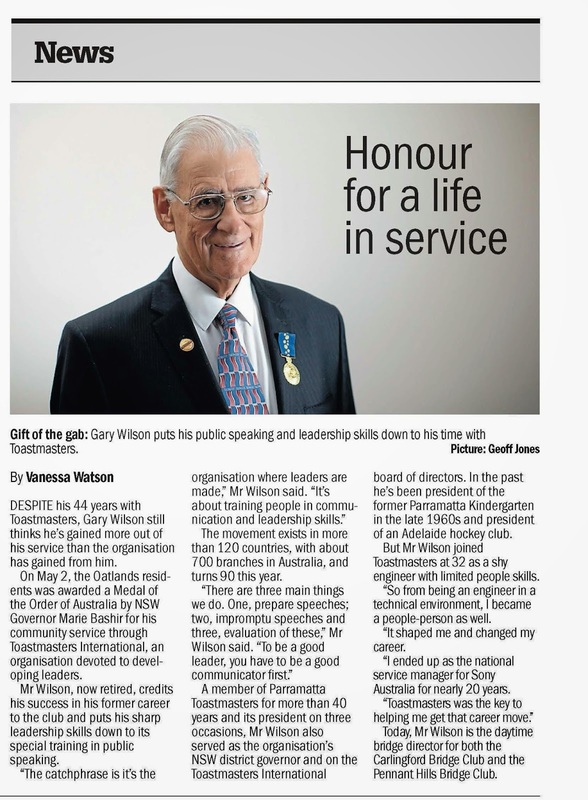 Fairfax journalist Vanessa Watson kindly wrote an article about Gary after his OAM investiture. Photographer Geoff Jones took a highly professional picture for the Fairfax article. This article brought Toastmasters to the local community. Gary was particularly thankful for the friendly mutual respect from Watson and Jones. This publication was put together at the same time as Elizabeth Wilson was diagnosed with cancer. Family such as Melanie Suzanne Wilson are very grateful for outstanding work by Fairfax with Toastmasters. Carpe diem. Seize the day. You never know what tomorrow will bring. Any day could be our last. Before you think I'm a tree hugger, I should probably explain. I was standing right next to this tree on a weekend morning, when it came crashing down. I was reading the latest news when a ripping sound grew. It sounded like crunching into raw veggies. I didn't think twice of this initial cardboard sound. Until it became alarmingly loud. I looked up to see the oldest, most established, tree in the street splitting into two. 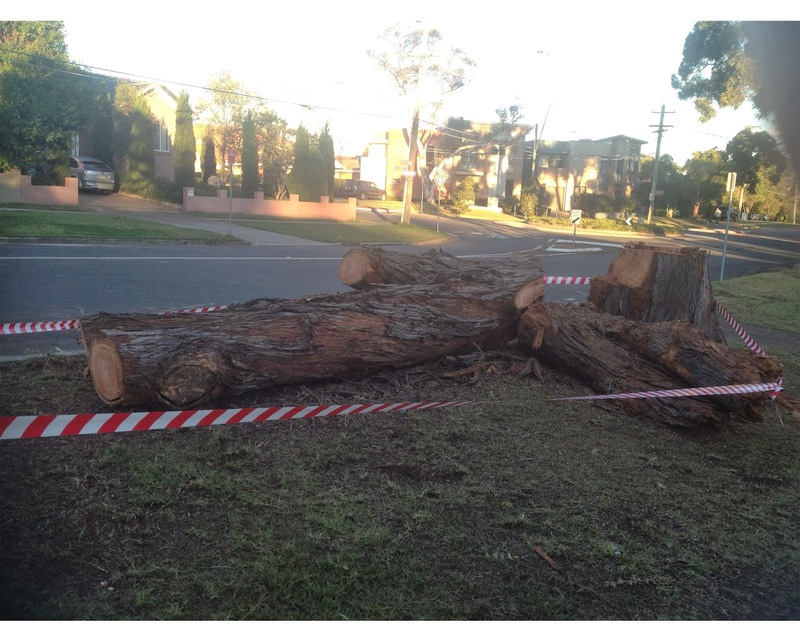 This timber landed right into the middle of the road. Right next to me. A frozen shock ran through me. This tree had two options as it died of old age and broke. It could either fall onto me, or onto the road. Nothing in this world lasts forever. But I thank God that it didn't take me down with it. Judith Durham inspires Baby Boomers to keep doing their crafts for as long as it is beneficial. Judith recently spoke to the ABC about working during the golden years. Judith's messages can be universalised for anyone who steps out into public life. Even the iconic Judith Durham wondered whether she could keep working, especially after health problems such as the brain haemorrhage. "You feel like life must surely be coming to an end... I never dreamed that I would still be able to do it." It's all about ignoring that voice of doubt which everyone hears at times. Try persevering regardless. Judith says, "You've got to take a chance... You can't assume it's not going to be very good... I'll just take one step and who knows what might happen." Judith takes a leap of faith when she walks onto the stage. Everyone can learn from the way she overcomes risks. The International Fellowship of Rotarian Doctors are using their skills to change lives of the disadvantaged. 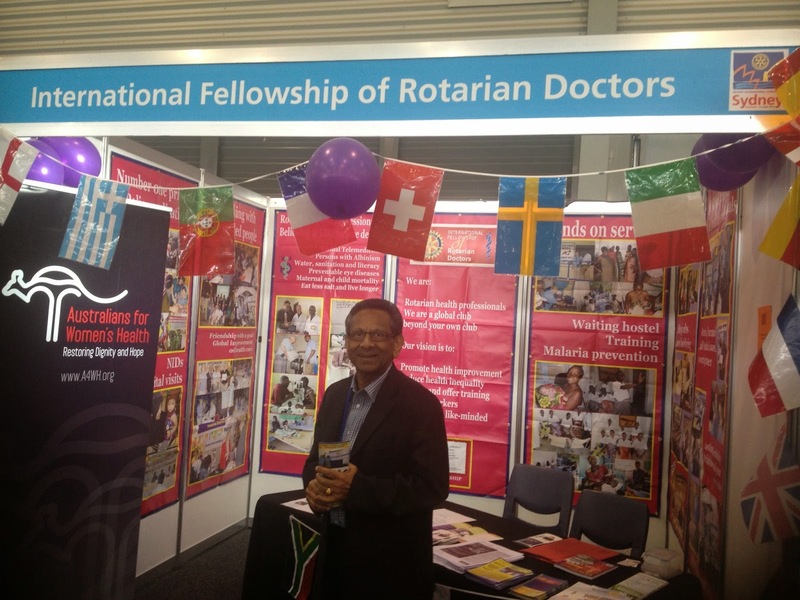 These doctors discussed charitable causes at their booth for the 2014 Rotary International Convention in Sydney. The Fellowship of Doctors implements specific projects such as maternal mortality reduction and assisting with the eradication of Polio in India. Maternal mortality is an important issue to these Rotarians. A Slideshare page from Rotary International says, 'three pregnant women and twenty babies die every minute.' The site says; solutions by these doctors include training professionals, social mobilisation, family planning, and health frameworks. Polio was conquered in India thanks to Rotary International's India National Polio Plus Committee. Rotary worked with internal partners such as the Fellowship, and external partners such as the Bill and Melinda Gates Foundation. The Seekers wererecognisedby the Order of Australia for the Queen's Birthday honour list.Judith Durham,Athol Guy,Bruce Woodley, andKeith Potgerrecently completed their 50th Anniversary tour in the UK. All four original band members deserve the prestigious title of Officers of the Order of Australia (AO). Thistitlesurpasses the Medal of the Order of Australia OAM, which Judith received some years ago. Judith Durham spoke to the ABC about the honour. Judith Durham is extremely blessed to make public appearances and sing. Judith suffered from a haemorrhage in 2013. Judith celebrated her 70th birthday in Epworth Hospital, as reported by3AW Radio. AAP quotesAthol Guyon Judith's miraculous touring, "Every step along the way seems to be almost pre-ordained. There almost seems to be a signpost saying `go in this direction, otherwise look out." Human Nature opened the Rotary International Convention in Sydney for a diverse audience. Volunteers from around the globe were entertained by Australia's favourite Motown singers. The Allphones Arena was filled with excited Rotarians from all ages and nations. The boys took a break from their Vegas shows to help their home country. Andrew and Mike Tierney, Phil Burton and Toby Allen sung Motown classics. This group represented Australia perfectly as always. Human Nature performed for the 2000 Sydney Olympic Games, and the Australian television filming by Oprah (according to their official web site). The boys grew up in a suburb close to Olympic Park. So this gig was right at home. What a perfect way to present Australia to the Rotary world. Rotaractors from all over the world gathered in Sydney for the 2014 International Preconvention. Young people everywhere should make an impact today. This was a message from the current Rotary International President, Ron Burton. He believes youth are not the future, they are the present. Voluntary organsiations have an ageing population just like the rest of the world. The most experienced skilled volunteers are looking to pass on their knowledge to the next generation. Rotaractors serve the world in fun ways. It's not just about raising money. It's a community. The Rotaract International Preconvention was a truly social experience in Sydney. Individual Rotarians took extra time networking at the New Generations Celebration. They want to be actively involved with Gen Y. Many Rotaractors are now networking with Rotarians of all ages at the main Rotary International Convention until Wednesday 4th June.